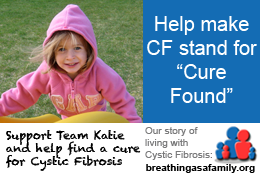 We dream of a time when CF means “Cure Found”. Join us as we fight this deadly disease – volunteer, advocate, donate! JOIN TEAM KATIE or DONATE today!